Last week I flew to Kansas to visit my grandmother and my aunt & uncle with whom she lives. One of the things we did to pass the time was to work on a jigsaw puzzle. Now, when it comes to video/computer games, spoken riddles, murder mysteries, etc. my brain enjoys a good puzzle. However, this particular puzzle was hard. In fact, I'd say this was the hardest jigsaw puzzle I have ever tried to complete. 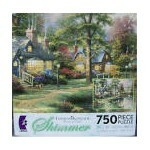 It was a 750 piece Thomas Kinkade picture, so each piece was particularly small, and most of the colors were soft and difficult to distinguish from each other. Working on this puzzle was the kind of thing that makes you understand how there can be violence in the world. I just wanted the misery to end... but at the same time I felt strangely compelled to keep working. 2 Peter 1:3 (NIV) says, "His divine power has given us everything we need for life and godliness through our knowledge of him who called us by his own glory and goodness." On the table, we had everything we needed to complete the puzzle. We were even able to put together the edge pieces to form the frame. However, we still had a hard time fitting in the middle pieces. Sometimes our lives seem like that. We can trust that we have everything we need to live a godly life, but most of the time living a godly life is still very hard. God is absolutely perfect, and His will is absolutely perfect... and he actually bothers to offer us love (John 16:27; Revelation 1:5), total forgiveness (1 John 1:7,9), full lives (John 10:10), and the same power that raised Jesus from the grave (Romans 8:11) But, we can't even stick to our diets/exercise plans, finish our chores, and keep ourselves from wasting time on the Internet. (Hmm, maybe that's just me...) The pieces are all there. We just grow weary of trying to fit them in, and so they lie there in a mess on the table. When we take this perspective, it is easy to start feeling stupid. The fact that we each lack nothing but are still a mess can make us feel infinitely incompetent. However, that's like saying, "I know all the letters of the alphabet. Why can't I write a novel?" Obviously, writing a novel is more complicated than that. For one thing, it has to be inspired. Also, there is a lot of research and study involved. To write a book, not only do you need to know a great deal about your subject matter, but you also need to know about grammar, punctuation, and writing techniques. In the case of the puzzle, our "research and study" consisted mostly of looking at the complete picture on the box. I don't even want to think about trying to put the pieces together without some kind of a standard. In the case of our lives, we have (of course) the Bible, the Holy Spirit, and the example of other people who have the same goal. Ultimately, though, I think the best way to get a complete "puzzle" is to let God be the one to fill in the pieces. The truth is that we are infinitely incompetent, but everything is possible with God (Mark 10:27). Sometimes we think we know which piece goes where. In doing my puzzle, there were many instances of me picking up a piece, looking at it, and assuming, based on the shape, colors, and patterns in it, that it fit in a certain spot, only to discover that I was wrong. In those cases I just wanted to mash the piece in anyway and make it fit. I'm sure I have done the equivalent even more times in my real life. However, that doesn't work. If I put a piece in where it doesn't fit, 1) I won't have that piece to put where it is supposed to go, 2) when the real piece comes up, it won't have a place to go, and 3) the other pieces around that piece will likely be wrong too. Proverbs 16:25 (NIV) says, "There is a way that seems right to a man, but in the end it leads to death." ;Also, Jeremiah 10:23 (NIV) says, "I know, O LORD, that a man's life is not his own; it is not for man to direct his steps." Finally, Proverbs 20:24 (NIV) says, "A man's steps are directed by the LORD. How then can anyone understand his own way?" In practice, it is hard even to know how to give God that kind of control over our lives. Like Isaiah, we can say, "Here am I. Send me!" (Isaiah 6:8), but because we still have to make little decisions every day—which driving route to take, how much time to spend watching TV, which stocks to buy, etc.—it still feels like we have to put the pieces in ourselves. Just like doing my puzzle, life is not easy. But, the more we really internalize the fact that God is in control and that He has given us everything we need, the more we can come to trust and rely on Him. When we find ourselves saying, "But... that piece goes there!" we should try to remember to let go of our control and rejoice in the fact that God knows what He's doing. As further proof that we can trust God, I want to tie in a small thing that happened to me today. When I first opened my eyes this morning, I looked at the clock and saw that it was 8:28. That number is permanently stamped in my brain because of a cross-stitch that was on the wall in my dining room growing up (incidentally, given to my parents by my same aunt in Kansas). On it were the words of Romans 8:28 (which was also, interestingly, part of my daily reading yesterday), which says, "And we know that in all things God works for the good of those who love him, who have been called according to his purpose." With God working for my good, I don't have to worry that I don't have all my pieces put together. I can just focus on loving Him. What about you? Do you have any "puzzle pieces" you have tried to mash into your life that don't fit? Do you feel overwhelmed by having a mess of pieces on your table that you can't fit together? Have you experienced God putting in the pieces for you?